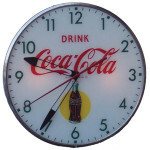 This classic old clock is made of wood, and features a beveled top with knobs and engravings. The pendulum swings freely from the bottom of the clock. The words “Gem Damaskeene” appear at the top. A cartoon depiction of an old man appears in the center of the clock face.